The Y-chromosome is inherited mainly unchanged from father to son. It follows the direct paternal line back in your tree, through males only. – find matches among men who have almost identical Y-DNA (STR-markers) and who you will share a common ancestor with through the direct paternal line (patriline). This method can be used to test several men with the same common direct paternal ancestor, as control test to check if our genealogy work is correct. Testing of several men in the same line can verify genealogy. – show which Y-haplogroup you belong to, e. g. I1, R1a and R1b which are the most common ones in Norway. Through SNP-testing you can discover which group (subclade) of your haplogroup you belong to. There are many different Y-chromosom tests, and the main difference is what and how much they test. to define subclade of the haplogroup, additional SNP-tests are neede, either single-SNPs at $39 or through bundles like Geno 2.0 ($199) or Big Y. 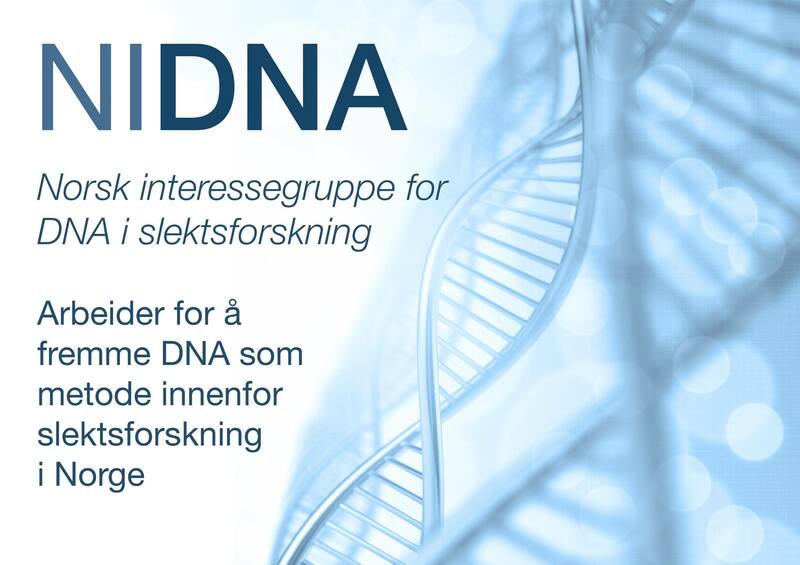 Ideally all possible Y-DNA and mtDNA-lines from Norway should be tested and “archived” for the future. The result list can be viewed as a genealogical source. The quality of the source will increase when we have lines verified through several tests. In the Norway Project/FTDNA most people start with a STR-test (Y37 or more), which is useful for comparison with other Y-tests to discover other males descending from the same direct paternal line. SNP can be tested individually (one by one) or in bundles up to complete Y-chromosome, and will decide one’s place in the Y-tree. With extensive SNP-tests like BigY one can also do comparisons to find other males descending from the same direct paternal line. The maximum testing for Y is Y111 with 111 STR-markers, and BigY with around 10 million base pairs (SNPs). To compare results with other men and their paternal lines, testing of STR-markers (microsatelite) is needed. 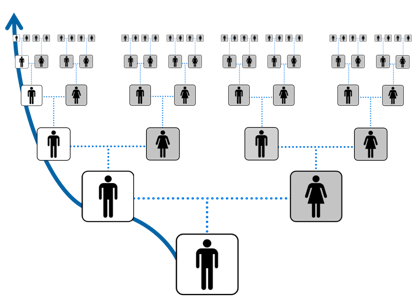 These STR-tests are used to find matches with other men in the same direct paternal line. The very first tests on the marked around year 2000 only tested ten STR-markers. Now a minimum of 37 markers are common, since you need a match at that level at least in order to find common ancestry within genealogical timeframe. Y67 is a better test, since one usually needs to have at least 60 out of 67 markers in common to have a common direct paternal line within the 1600s, sometimes even more. Y12 will test 12 STR-markers. FTDNA price is $59 (must be ordered through a project). Prices apt to changes, also check the FTDNA pages for sales and campaigns. The different STR-markers will mutate at very different rates, and when evaluating matches this must be taken into account. There is a list of average mutation rates in Wikipedia. There are two approaches to a Y-DNA-test (STR-markers), where the point is to compare to other testers. One is to do a test, and then see if any matches appear by chance, like throwing out bait on a hook, fishing for a match. The other is systematical testing as control of your genealogy work: You trace other direct paternal descendants of your paternal ancestor, as far off from yourself as possibe, and test them to check if that person’s Y-DNA match your own. Matches found through the “fishing-method” will normally be very far back and impossible to follow into the genealogical timeframe and written sources. The most useful application of both Y-DNA and mtDNA-testing for genealogy is through such verification tests where several lines back to the same known paternal (or maternal) ancestor are tested, to verify genealogy or confirm a theory. Control testing for verification of genealogy give more interesting results than “fishing” for chance matches with men already in the database. SNPs can be tested to define haplogroup and sub-group (subclade). This is about “deep ancestry”, the antropological perspective. At the same time it is helpful for genealogy testing, as you need to be in the same subclade to have a common direct paternal ancestor (within appr 1000 years). There are hundreds of new SNPs discovered every year, so it is essential to join the relevant haplogroup projects to receive information and news on which SNPs that could be relevant to test. Single-SNPs can be ordered separately from FTDNA as upgrade to an ordinary Y-test (STR); ask your project administrators of your Y-haplogroup project which ones are most probably positive and relevant for you. Price: $39 each, so most economical if you know which ones are likely to be positive. Log in to your FTDNA account to look for available SNPs under “Advanced Tests” (not SNP-tree or “advanced SNP-tests” hich are based on the “old ones” from the 2009-version of the Y-tree – this will be updated by FTDNA, but we don’t know exactly when). Big Y tests approximately 10 million SNPs and can discover new and private ones, so the test is the most extensive one at FTDNA. Price appr $ 700. Geno 2.0 from the Genographic project will test hundreds of SNPs and definer your subclade of your haplogroup. The price is $199 + shipping. Resultats can be transferred to FTDNA once ready, since the actual analysis is performed by their laboratory. The testen does not include STR-analysis, but this can be ordered as an upgrade through FTDNA later. Chromo 2 Raw Y-DNA from Britains DNA test a large number of SNPs typical of European men. This test has nothing to do with FTDNA and interpretation require expert help. Check with your Y-haplogroup administrators for relevance. Full Genomes Y-chromosome which test the complete Y-chromosome, about 50 million SNPs, price $1.250. The test is not related to FTDNA and needs expert help to interpret. Ask your Y-haplogroup project administrators for advice. 23andMe will only test a selection of SNPs in their Y-chromosome analysis, so you get to know basic haplogroup and perhaps sublclade, limited to the SNPs included in their “package-test”. Transfer from 23andMe or Ancestry for free!